Hello Everyone This is my latest work i have been working for last couple of days and now finally got the time to finish up. 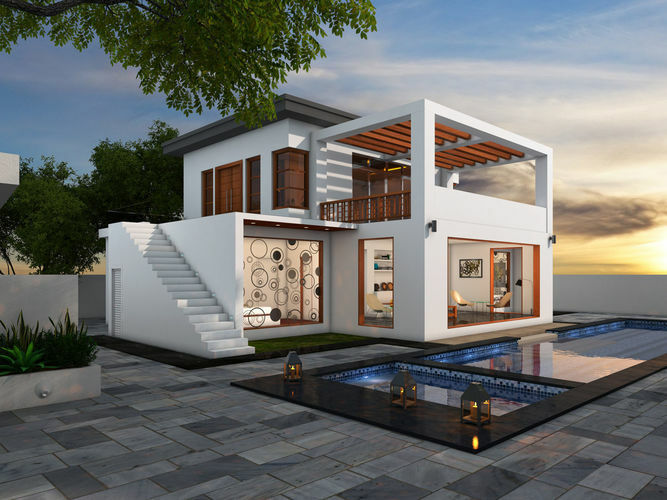 This Contemporary Modern House (around 3500 Square feet) with beautiful Pool and generous open spaces featuring Living Area (The living room communicates with the exterior directly),Dining Area,2 bedrooms, 1 Master Bedroom etc. This 3D model of Contemporary House created on real base, with all textures and materials. It is ready to use, just put it into your scene. It’s created accurately, in real units of measurement. This product was created in 3ds Max 2013, Preview render made with V-ray 2.4 This is the final rendered image by 3DsMax. Textures included in the 3ds Max zip file. Please feel free to contact me if you have any questions. Comments and critics are most welcome!! !